Marijuana stock Tilray has dominated the media over the last week, making early investors (read: anyone who bought it more than a month ago) boatloads of cash. The stock skyrocketed from its July IPO price of $17 and reached highs of $300 on Wednesday, before paring gains and finishing the Thursday session around $172. But it appears that not everybody benefited from the spike higher in the name. 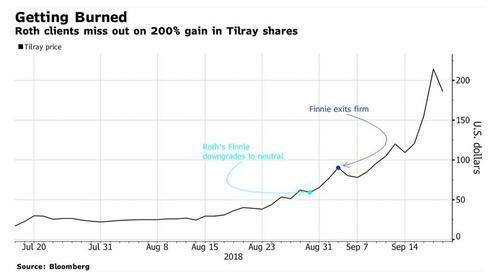 Analyst Charles Finnie from Roth Capital Partners, who tried to warn the investing public that Tilray looked "increasingly speculative" at $59 - after the stock had more than doubled - and Downgraded it to Neutral, has now "left his job" after making said call. He quit on September 5, a day when the stock closed at $89, and just two weeks before the pot stock euphoria sent it to $300. Shortly after he downgraded his Buy rating on the name on August 30, TLRY proceeded to surge 45% over the next five days. From there, it doubled again. Finnie tried to warn investors about the company's limited float and how it could cause volatility. He was right about the volatility – except it came to the upside, not the downside - with the stock tacking on nearly $240 per share at one point after he issued his note. Still, not only was Finnie right about the volatility - if in the wrong direction - he was spot on: trading in Tilray on Wednesday was so volatile that the stock was halted 5 times. During this time, we reported that investors in Tilray like Peter Thiel had made a killing on the name. Thiel was invested in TLRY through Tilray CEO Brendan Kennedy’s Privateer Holdings, which holds more than 58 million of the total 76 million shares outstanding. Their stake is now valued somewhere near $10 billion thanks to the stock's "volatility". Despite the interesting timing behind Finnie leaving the firm, Roth Capital claims that he chose to leave. Jeff Martin, Roth Capital’s director of research told Bloomberg that he left "on his own accord" and that plans to replace him "haven't been finalized". Perhaps Finnie just didn’t know the rules that every other analyst on Wall Street seems to live by in today's market environment: don’t try to warn investors when their capital could be at risk, otherwise they miss the mania and you could be out of a job as angry clients complain to your boss for having listened to you. And while Finnie will ultimately be proven right, in this case timing was all that mattered. Now, if only everyone on the street was just as accountable, and left their jobs "on their own accord" after missing a call, the monthly JOLTS reported would be far more exciting.